TGIM – Happy Memorial Day! Life is an adventure – go live it! Find your purpose and run towards it with all that you have! Attack the day with vigor and enthusiasm. Tell yourself you are amazing and you can accomplish amazing things! Life can be an adventure if you believe in the beauty of your dreams. Do not give up on those dreams that are inside of you and that you can not stop thinking about. Be grateful that you get to live another day. Today is a great day to be alive. Now go out there and go after what is yours in the universe. Today is the first day of the rest of your life. How are you going to show up in the world today? Think of one small step you can take today to accomplish your goal or dream. Go do that one thing today. We only get to live so many tomorrows. The time will pass in the same way whether you are pursuing something amazing or not. Go live today’s adventure that is waiting for you and go become the person you were intended to be. 1. I am a unique child of this world. 2. I have as much brightness to offer the world as the next person. 3. I matter and what I have to offer this world also matters. 2) Or share this e-mail/post with a friend who might need some motivation or encouragement this day! You are amazing just the way you are! THOUGHT FOR THE DAY: You are amazing. You are wonderfully made. You are special. The life you are living today is a total gift. Today you have the power to choose. And if you are reading this right now, you made a choice to check your email and open up this one. And then for the rest of this day you will have the power to make many other amazing choices. You can choose to feed your body healthy foods. You can choose to give your body the exercise it needs. You can choose a positive and fun attitude today even if things do not go your way. You can choose to be yourself and live a life of purpose and meaning. You are unique and there is not another human like you. You have unique gifts and life experiences. No one else has fingerprints like you. You are special. So on this amazing Monday I hope you can see yourself as the awesome, amazing, lovely, talented and gifted person that you are. Because if you do that, then the world will be just a little better place today because you know you have worth. And then you can treat others like they have worth too. And you can spread love around to other people you see today. I am my truest self and that is enough. My true self is inherently beautiful. I deeply accept my wonderful and unique self. 5) Are more likely to accomplish personal goals. 6) Are more likely to exercise and stick with a self-improvement program like losing weight. And who would not want any or all of those benefits? I invite you to give this gratitude meditation a try. I also suggest starting a gratitude journal where you write down 3 things you are grateful for every day. Tell someone else three things that you appreciate about them. 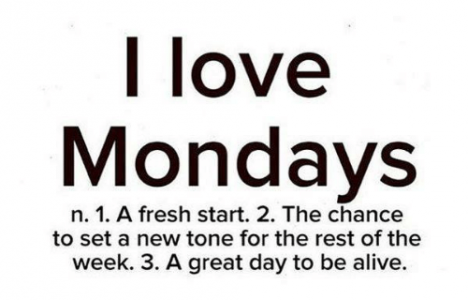 And let’s have a great Monday! 1) I am thankful for every situation in my life. 2) I am thankful for the wonderful nature around me and the chance to live in this incredible world.